Las Vegas, in the 1970s and 1980s, was the place to be if you wanted to see or be in burlesque. In interviews with columnist Dusty Summers, burlesque icons including Christine Darling, Angelique PettyJohn, Gina Bon Bon, Delilah Jones, Susi Midnight, and Georgette Dante reveal how and why they became burlesque performers. Top bananas and comics including Artie Brooks, Professor Turban, Joey Bishop, Bob Mitchell and Charlie Vespia tell you how a man gets into burlesque. 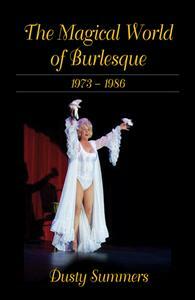 It is an inside story of burlesque in the words of the insiders! Contains over 150 photos!